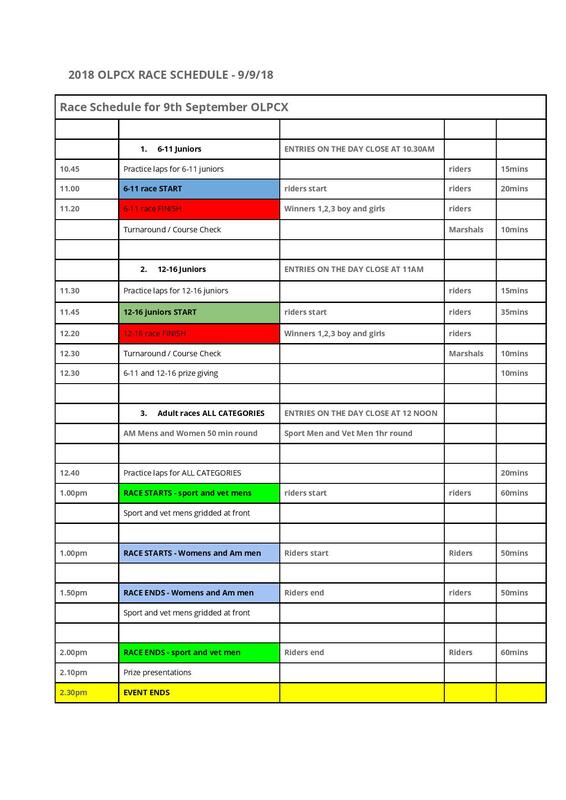 OLPCX Round 3 – Olympic Legacy Park, Plan your day – Sheffield Urban CX 2018 – Entries Live! Because of the increase the amount of space that we’ve got at the Don Valley bowl it means that we can start with a mass start, as you have come to expect from us it’s a slightly unconventional one in that we’re going to be starting all the adult categories at same time. The Amateur Men and the Woman’s race will run for 50mins, The Sport Men and Veteran Men will run for 1hr, a change format from the smaller field sizes due to the increased space the racing should be fast and exciting. The day’s racing will start with the 6 to 11 race at 11am then followed by the 12 to 16 race. The adult categories will start at 1pm. This means a shorter but it’s going to be action packed all the same. Registration will be held at ICE Sheffield by the start finish line the usual friendly registration team will be on hand. Entries will be available on the day, with entries on the day for children closing at 10.30am and Adult entries on the day closing at 12noon. car parking will be available in the English Institute of Sport car park and also ice Sheffield price of parking over £5 for the day this is due to the car park being managed and operated by Sheffield international venues. The Olympic Legacy park is right by the Sheffield Canal, this offers another fantastic traffic free option but it will take you from Victoria Quays, canal basin, in the centre of Sheffield all the way out to Don Valley Stadium who knows maybe you might see some Heron or even the elusive kingfishers that flit along this amazing green corridor. it’s going to be a great Race and we look forward to seeing you on the 9th of September there are still entries available in all the categories and we are also on the lookout for a few more Marshalls to help make sure the event runs smoothly spectating is free so come and cheer the riders on, bring on the cowbells! We are proud to be the first cycling event that has been held at The Olympic Legacy Park. It’s going to be an amazing venue for round 3 of the Sheffield Urban Cyclocross series. At the heart of Sheffield’s Industrial Venue is in the heart of Sheffield Industrial Heritage with the Forgemaster’s standing proud amongst the busy commuter traffic flowing along Attercliffe Common. A bright Yellow Jersey shaped ‘Legacy Stone’ marks where the finish line of stage 2 of the 2014 Tour de France stood, Italian Rider Vincenzo Nibali took taking the yellow jersey. A pretty inspiring day Sheffield and one of the defining moments in the story of sporting kudos in this once industrial heartland of the City. Looking down Attercliffe Common there is a sea of traffic on the homeward bound commute, if your on a bike however you can avoid the mayhem using one of the traffic free routes in this area, linking into an urban green corridor that takes in some hidden views and perspectives of Sheffield’s industrial heritage. Now the surprising thing is although the world’s largest cycle race came to Sheffield there have been surprisingly few cycling events held at the Don Valley bowl or the Olympic Legacy Park. 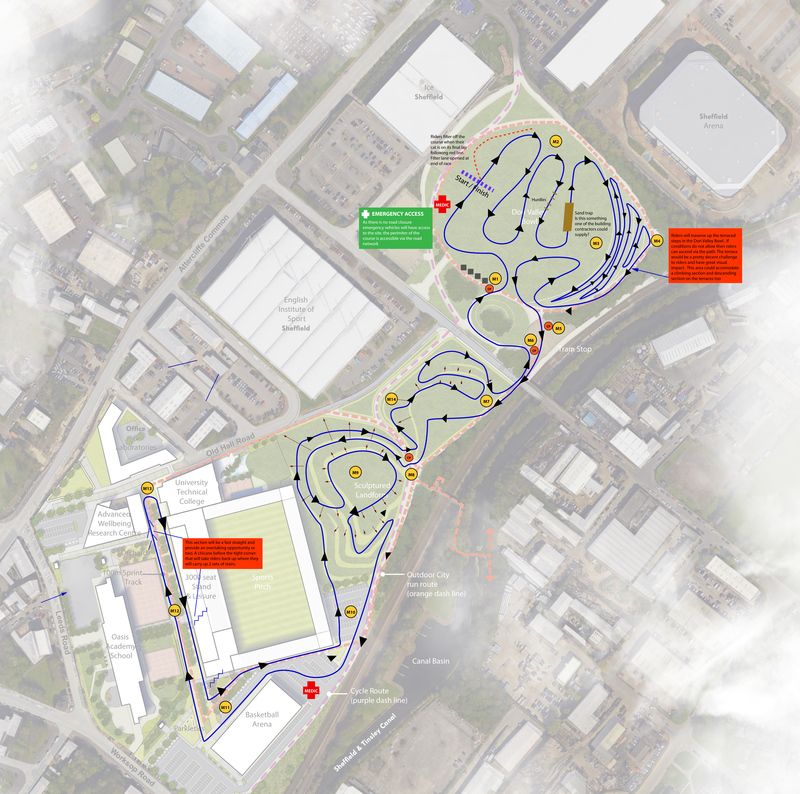 We like to be first at doing things at Sheffield Urban CX, and this Sheffield location and it’s heritage, left us wanting to explore the potential of running a course at the Olympic Legacy park and Don Valley Bowl, it was a perfect fit for our criteria.